Problem:A water remediation company used a blend of water and corn syrup in water wells to accumulate bacteria in water contaminated by chemicals. Both the water and corn syrup volume needed to be accurately metered to achieve the proper blend to maximize the remediation of the contaminated water. To achieve this accurate measurement this company needed economical metering devices. Assured Automation was called to recommend meters that would work well with the water and corn syrup mixtures. 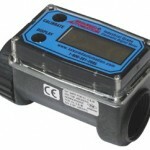 The rugged G2 Series meter was suggested for the main water line. This meter works well with clean fluids that are free from particulates. This versatile meter is easy to install in-line, includes an easy to read display and can be mounted in different orientations. The A1 Series meter worked great with the water and corn syrup mixture. The rugged nylon construction of this meter is designed for outdoor use. The large display with 1/2 inch digits is easy to read enabling the field engineer to quickly and accurately determine the amount of corn syrup/water mixture added to the well water. The Assured Automation flow meters were accurate, compact and economical and helped purify the water in an efficient and economical manner. This entry was posted in Flow Meter Case Studies, Flow Meters, Latest News and tagged A1 Series digital water meter, Digital Flow Meters, Digital Water Meters, Flow Meters, G2 Series Industrial Grade Flow Meters, Industrial Flow Meters. Bookmark the permalink.